Rachel Aina Call, age 14, lives in Provo, Utah. 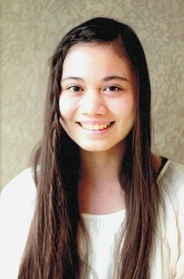 She is a full scholarship student at the Gifted Music School where she currently studies with Eugene Watanabe. Rachel has been a finalist for Utah Symphony's Salute to Youth competition in 2013, 2014, 2015, and 2016. In 2016, Rachel was invited as a member of a quartet under the direction of Eugene Watanabe to compete in the quarter-finals at the 43rd Annual Fischoff Competition scheduled to take place in May on the campus of the University of Notre Dame in Indiana. In 2015, Rachel performed as a soloist at Carnegie Hall as a winner of the International American Protégé Competition. She has also performed with the Utah Symphony, Timpanogos Symphony, and at the Utah Symphony's Youth Guild Recital. In 2014, Rachel performed as a soloist with the American Fork Symphony, the Oquirrh Mountain Symphony, and at the Utah Symphony's Youth Guild Recital. In 2012, Rachel was a soloist with the Utah Valley Symphony. In 2011, she performed at the Sulzbach-Rosenberg International Music Festival in Germany. Rachel has also been a guest performer at several master classes. She performed in a master class with founding violinist of the Guarneri Quartet, Arnold Steinhardt in November 2015. In March 2015, she performed for a pre-college level master class at the annual convention in Salt Lake City for the American String Teachers Association. She was also chosen to play in a master class for Utah Symphony Youth Guild members with Latvian classical violinist, Baiba Skride in February 2015. Rachel loves soccer, is an eighth grader at Centennial Middle School, and is fluent in Japanese.